This review is our first on line and we don't have a clear idea about the exact space to dedicate to this kind of articles. The web is different from paper and we cannot adopt the same rules that applied for the traditional magazines. On line things go faster and we have to follow being faster too. We will try and do so it even if the kind and importance of the components would deserve a lot of space. 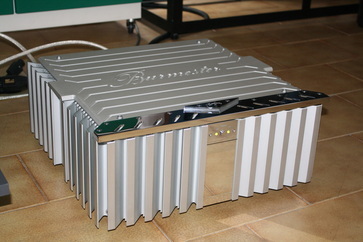 Burmester needs not to be presented to audiophiles. Let's start talking about the CD player 069, Burmester's top device, included in the line Reference, the highest technological expression of the Berliner manufacturing house. It's a device that reads only Red Book CDs and has top loading. 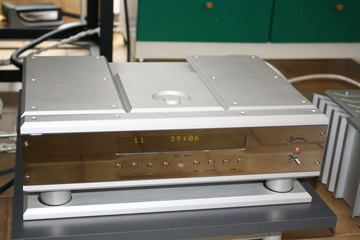 It's different from all other CD players, exception made for CEC, because it has a belt drive top loader. The mechanic aspect is typical of Burmester's products and is of clear German extraction: heavy and thick tin sheet, mirror-polished chrome front. The switch-on button is on the right side with a LED that shows its operational state. The green display occupies the central upper part of the front and, immediately below it, there are some circular buttons to operate the device. All these buttons are replicated on a big and heavy metal remote. The back part is a little more complex. On the left side we can find the AC main terminals for the power cable - the one that comes with the 069 seems to be of a very good quality - and the power switch. Then there are Burlink interfaces for the control of the device via computer, the balanced and unbalanced outputs, optical and coaxial inputs, and a balanced line input. This last characteristic tells us that it works also as a pre-amplifier and it can be connected directly to a power amplifier. And this is how we will connect it for this test. There is also a heavy clamp to put on the CDs before closing the lid and start the reproduction. The player is positioned on a thick tin sheet that has slots for the 4 feet. Between the base and the foot we must put 4 kevlar disks that come with the device.There is a feature for choosing between 96 or 192 kHz upsampling. The CD player weights 25 kilos. 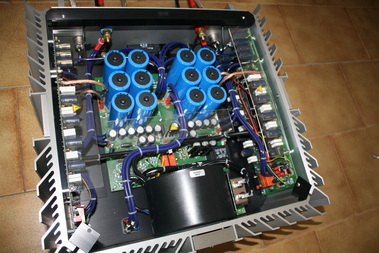 The power amplifier, model 911 MK3, belongs to the Top Line. We have 31 kilos of perfectly refined metal, an outstanding design and the characteristic of having the heat sinks folded. In the front part, centrally, a small chrome panel shows the switch on/off button and the LEDs that inform on the operational status of the device. 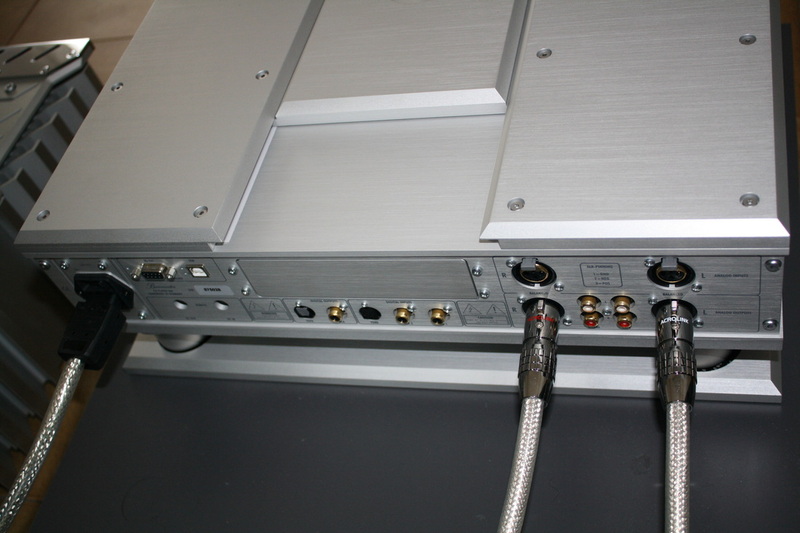 The back part shows the usual terminal for the power cable, the switch, the balanced inputs and the 4 binding posts of a very good quality and very strong. 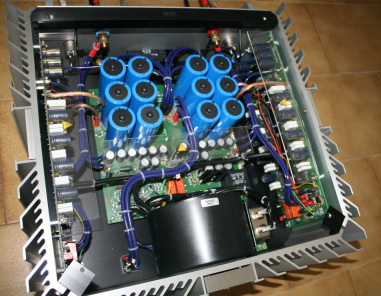 This amplifier performs 340 Watt on 4 Ohm and can be bridged to double its power. 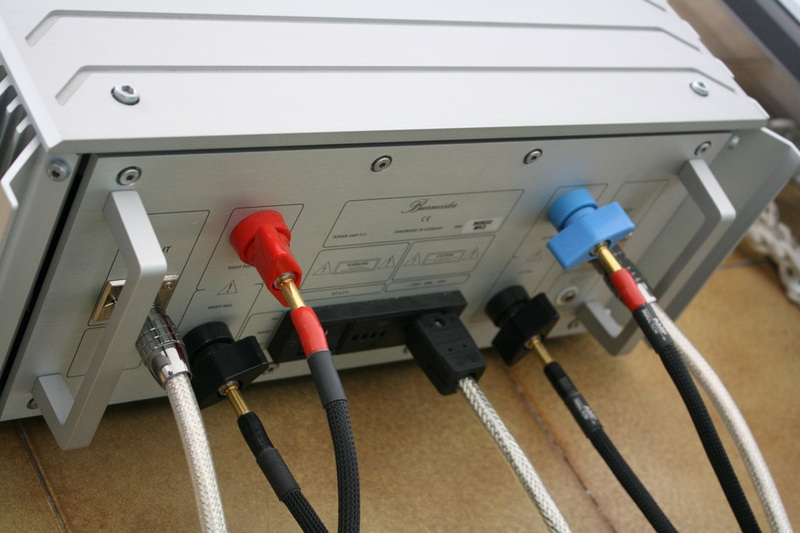 The Italian distributor claims that bridging leads to a clear sound improvement. The two Burmester have been used with the following equipment: Basis 2001 turntable, scan Tech Lira Helicon cartridge, Graham 2.2 tonearm, phono cable LAT International XLR, Einstein "The Turntable's choice Balanced" phono preamplifier, cables Acrolink Mexcel between the CD player and the pre-amp, loudspeakers JBL 4350B, power cable MIT Magnum MA, net filter: Black noise 2500. Scarcely half an hour of warm-up and these two German devices start to "sing" at their best. For the first minutes of listening I usually choose between the so called “warm up” records. These records don't have a characteristic apt to a critical listening but are records that I like for their artistic content. This time I choose to listen to Paolo Conte and his double CD Aguaplano (CGD). The dynamics of the piano and the songwriter's voice are outstanding. The four 15" woofer of my JBLs are led to levels not usual for my reference. An half octave seems gained. At the end of the song "Max" I pushed "skip" on the remote to re-listen with a higher volume. This can give you a hint on the liking. To test the bass control of this couple I switch to the CD "Sultans of Swing" by Dire Straits (Vertigo). During the homonym song the sound pressure goes beyond 110 dB and it's just like watching a fireworks parade. The rim shot speed on the snare drum of the drum set is impressive. Mark Knopfler's solo is dramatically acute and real. Yes, real! The medium range is very close to live listening. Forget the laid-back sound, colored at the edges of frequencies of other electronic devices. Here the extension is very wide but linear. And now it's time to listen to something acoustic, Monteverdi's Vespers of the Blessed Virgin. It's a double Cd that I'll soon review in a dedicated space. Archive is the label and John Eliot Gardiner directs in the wonderful venue of St. Mark's Church in Venice. The standard of the reproduction is once again very high. Voices show new aspects and the church environment is perfectly reproduced. The virtual soundstage is very large and depth is perfect (and real). The tone color of the instruments used is perfectly reproduced. The last listening is done using the CD "Trio in Tokyo" (Dreyfus Jazz) a Michael Petrucciani, Steve Gadd and Anthony Jackson's live jazz. and technique. Petrucciani's piano is perfectly balanced in the three listening zones into which we can ideally divide it: bass, medium, high. Everything's in its place and there are no signs of harshness even in the highest instrument's keys. Every note of the double bass is perfectly distinguishable. I want to highlight few things that concerned me during my test. One of these was the annoying lack of silence between the notes that bothered me during the first listenings. Reading carefully the CD player manual I found out that the gain can be set. Regulating it on 10 dB less and put in the “low” position improved things. It's not all perfect yet (nothing is perfect), but in this way is much better. Furthermore is that it's not always easy to choose between oversampling at 96 or 192 KHz. After few tests I noticed that the sound with the higher value is more present, airy, but maybe looses a bit of "easy" listening. Anyhow I used mostly 192 KHz. What can I say? It's a dream that will last little time. Top Audio Video in Milano will open up in a few days and the Italian distributor will come and get his electronics. Anyhow I made up my mind and decided that until Burmester are welcome guests in my house I will not watch tv or go out with friends. 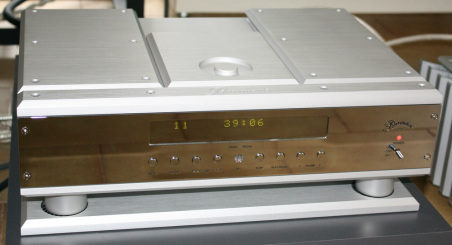 I try to imagine how it might sound if between the CD player and the amplifier I'd have the chance to connect a real Burmester pre-amp, maybe the 808...well, I'd rather not know it! This German stuff has a real good sound and deserves a place among the best. In these pages you'll never read "the best" because we have not tested everything and also because it's a very subjective assertion. You may prefer a different kind of sound but such a control of the bass, for an instance, is hardly attainable. The price of the components is usually discussed at the end of the reviews. I have often stated that we can speak about quality/price ratio only up to a certain level. Here we speak about very high costs and I'd rather think about a cost/benefit ratio, a very subjective parameter on which no one can have the definitive word. For a billionaire, 54.000,00 euros for these two devices are not a big thing, and if he likes the sound (or the look) he'd buy them. Other audiophiles will listen to them and then decide that it's something worth spending for. What I can suggest to you is to listen to them in the quiet of your room, with your loudspeakers and the necessary concentration to understand them. Don't rest upon listenings during audio shows, you'd miss a lot.